This Agreement is made by and between, the renter, hereinafter referred to as “Guest(s)” and HomeLink Professional Realty Network LLC, hereinafter referred to as “Agent” for the short-term rental of vacation property, hereinafter referred to as “Property”. PLEASE READ ALL INFORMATION CAREFULLY. Any monies received by HomeLink Professional Realty Network LLC for occupancy of vacation property shall indicate the acceptance of the Terms and Conditions of this Agreement. It is the responsibility of the Guest(s) to be familiar with all policies within this agreement. A reservation deposit is required to secure the reservation. The reservation deposit amount will be equal to the cleaning fee and booking combined, and must be collected within 72 hours of booking the reservation. An advance payment equal to 50% (fifty percent) of the rental rate is required 60 days before arrival. The advance payment will be applied toward the rent. The advance payment is not a damage deposit. The BALANCE OF RENT is due 30 (thirty) days before your arrival date. Any other arrangements must be secured in writing. Agent requires a valid Visa and Mastercard number to authorize the Damage/Security Deposit. If you are paying for your reservation by check, you will need to provide a credit card for the Damage/Security deposit. 1. No damage is done to the Property or its contents, beyond normal wear and tear. 2. No charges are incurred due to pets. 3. No charges are incurred due to long distance/900# phone calls or Pay Per View movies. 5. All charges accrued during the stay are paid prior to departure. 6. All keys are left on the kitchen table and the house is left locked. 7. Garage openers, pool keys, extra keys, cards, passes & openers are left in Property at departure. 8. Ethernet, DSL, Phone and Television cables are not removed. 9. Guest does not violate any of the Terms & Conditions of this Agreement. If damages exceed the Damage Deposit amount, guest will be liable for the difference. Rates include a one-time linen/towel set-up. Condos (one bedroom) are $125 for cleaning upon departure. Vacation Homes are $250 for cleaning upon departure. A 60 (sixty) day notice is required for cancellation. Cancellations that are made 60 (sixty) days or more in advance of the scheduled check-in dated will receive a refund of deposit less the booking fee ($69) and a cancellation fee ($30). Cancellations made within sixty (60) days of check-in date will not receive any refund. Changes that result in a shortened stay, that are made within 60 days of the arrival date, will not result in any prorating, refunds, or reduction of rents. Early departure does not warrant any refund of rent or deposit. If the Property becomes unavailable to the Guest prior to occupancy, as a result of foreclosure, sale, destruction, or any other reason, Agent agrees to refund the full amount paid to the date of cancellation, and Guest agrees to release any claims against Agent. It is strongly recommended that Guests purchase travel insurance to cover the cost of a cancellation due to an unforeseen or unexpected event. Please contact our office for referrals to travel insurance providers. The maximum number of guests may not exceed the posted amount for the Property including children and infants. Additional arrangements may be made in writing for additional guests and additional fees may apply. NO PETS ARE ALLOWED unless they have been approved in writing and a pet fee of $150.00 per pet has been paid. There is NO smoking allowed at any time. This is a NO smoking property! Guest agrees to abide by all of the Covenants, Codes and Restrictions of the Community the Property is located in. While linens and bath towels are included in the Property, daily maid service is not included in the rental rate. We supply swimming/beach towels for the community pool. We do not permit bath towels or linens to be taken from the Property. Rates for other reservations are subject to change. Any reservation obtained under false pretense will be subject to forfeiture of advance payment, deposit, and/or rental money, and the reservation will be cancelled. Parking passes and garage door openers (if they apply to this property) will be located inside the Property. If the Property has a parking pass, it must be displayed on the rear-view mirror at all times. Failure to display may result in towing of vehicle at renter's expense. Leave parking passes and garage door openers on kitchen table of Property upon departure. If rental Property is located in a private gated community, Guests must adhere to all gated community rules and etiquette. This includes peaceful and quiet domain. NO LOUD BOISTEROUS PARTIES. Golf course green fees and associated charges are not included in any rental rates. Guests are required to secure all golf play at Guest’s convenience and pay associated costs. The Property shall not be used at any time by Guest for the purpose of carrying on any business, profession, or trade of any kind, or for any purpose other than as a private dwelling. Guest shall comply with any and all laws, ordinances, rules and orders of any and all governmental or quasi-governmental authorities affecting the cleanliness, use, occupancy and preservation of the Property. The Property is located in a neighborhood which has a “noise ordinance” in effect after dark. All Guests agree to respect the Noise Ordinance and to use common sense and decency in keeping the noise volume low after dark. Any police enforcement actions by the City, County or Home/Condominium Association are at the sole expense of the Guest and may result in immediate eviction and forfeiture of all amounts paid. Certain townhome and condominium communities have heated pools. If the Community has a heated pool the cost for pool heating will be included in the rent. 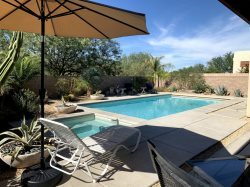 For private homes that have pools with the capacity to be heated there is an additional pool heating fee required to offset the extreme utility cost involved with heating a pool. However, in private homes with spas, the spa heating shall be included in the price of the rent. Pool heaters have electrical/mechanical components. These components can sometimes malfunction. Agent, its Vendors, and the Homeowner cannot be held responsible for any malfunctioning heater. Please inform us as soon as possible if your pool/spa is not working properly. Agent will do everything within its power to rectify any problems with malfunctioning equipment as soon as possible. No compensations will be given for a malfunctioning heater except for refund of the pool heating fee. NOTE: NEVER leave a child unattended around a pool or spa! There is no lifeguard on duty. You accept all responsibility for any accident or injury or death associated with a pool or spa at the Property. Please be careful around the pool! The Property owner will provide utilities in rental fees. However, if utility bills incurred during Guest’s stay exceed $300.00/month, Guest will be responsible for amount in excess of $300.00, which will be deducted from Damage/Security Deposit. 8. Abide by and be bound by any and all rules and regulations affecting the Premises or the common area appurtenant to the property which may be adopted or promulgated by the Condominium or Homeowners' Association having control over them. AS A REMEDY FOR VIOLATION OF ANY OF THE STATED CONDITIONS OF RENTAL IN THIS AGREEMENT, AGENT HAS THE RIGHT, BUT IS NOT LIMITED OR REQUIRED TO, TERMINATE THIS AGREEMENT AND EVICT THE GUEST FROM THE RENTAL WITHOUT ANY REFUND OF COLLECTED MONEY AND MAY KEEP ALL OR ANY PORTION OF THE SECURITY DEPOSIT. GUEST ACKNOWLEDGES THAT, IF ALL RENTAL MONIES HAVE BEEN PAID, THE MAXIMUM RECOURSE THE GUEST HAS AGAINST AGENT FOR ANY ALLEGED BREACH OF THIS AGREEMENT IS THE AMOUNT OF THE RENTAL PAID OR TO BE PAID TO AGENT ARISING OUT OF THIS AGREEMENT. Agent shall have the right at all reasonable times during the term of the stay to enter the Property for the purpose of inspecting the Property and all buildings and improvements thereon. And for the purposes of making any repairs, additions or alterations as may be deemed appropriate by Agent for the preservation of the Property or the building. Agent shall further have the right to exhibit the Property and to display the usual "for sale", "for rent" or "vacancy" signs on the Property. The right of entry shall likewise exist for the purpose of removing placards, signs, fixtures, alterations or additions that do not conform to this agreement or to any restrictions, rules or regulations affecting the Property. Agent shall not be liable for any damage or injury of or to the Guest, Guests's family, invitees, agents or employees or to any person entering the Property or the building of which the Property is a part or to goods or equipment, or in the structure or equipment of the structure of which the Property is a part, and Guest hereby agrees to indemnify, defend and hold Agent harmless from any and all claims or assertions of every kind and nature. Guests understand and agree that the Homeowners and Agent are NOT responsible for any personal injury or loss or damage to Guests’ property or person caused directly or indirectly from foul, inclement weather conditions, Acts of God or nature, failure of heat, accidents related to fire, heaters, stoves, theft, or any unforeseeable circumstances. Under no circumstances will Guests or their invitees hold the Agent or the Homeowners of the property responsible for any damages or claims of any kind resulting from their stay, except for intentional acts of harm. It is expressly understood and agreed that this is a short-term vacation rental and not a long term tenancy agreement. This agreement is only for the licensed use of the Property for the stated reservation term and does not create rights to renewal or for recurring usage. If any provision of this Agreement or the application thereof shall, for any reason and to any extent, be invalid or unenforceable, neither the remainder of this Agreement nor the application of the provision to other persons, entities or circumstances shall be affected thereby, but instead shall be enforced to the maximum extent permitted by law. The descriptive headings used herein are for convenience of reference only and they are not intended to have any effect whatsoever in determining the rights or obligations of the Agent or Guest. No indulgence, waiver, election or non-election by Agent under this Agreement shall affect Guest's duties and liabilities hereunder. Any exceptions to this entire rule agreement must be approved in writing in advance. I have read the Terms & Conditions of this Agreement in full. I understand and agree to and will abide by all of the Terms & Conditions as stated herein. I am providing my credit card number as a guarantee of payment to Agent. I agree to pay all rent and charges related to the property rental. I accept all liability for rent and charges related to the Property rental, as well as any damages beyond normal wear and tear during the term of my stay at the Property. I understand that these costs will be charged to my credit card. In the absence of another payment arrangement, I authorize Agent to charge my credit card for payment of these items.